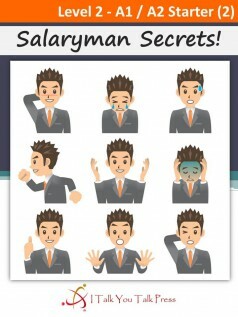 Home » English Graded Readers » Level 2 » Salaryman Secrets! Salaryman is a Japanese-English word. It means “businessman” or “office worker”. Japanese office workers work very hard. They try their best every day, but sometimes, bad things happen. In this book, ten workers in Japan share their embarrassing work stories. Keita has to give a presentation to new employees. It goes well, until he makes a bad mistake with his microphone. Yoshi works hard every day. One night, he was working in the office late. He was tired and hungry, so he decided to take his work documents home. The next morning, he makes a mistake. If his boss finds out, he could lose his job! Kotaro is a salesman for a medicine company. When he started working for the company, his boss told him to visit a hospital in the countryside. He went to the hospital in the company car. Then something terrible happened. Could he hide the trouble from his boss? Enjoy these short stories and more!